Church’s Chicken has over 1700 locations in 22 countries. In Puerto Rico they’re arguably the most popular chicken restaurants with over 70 units. 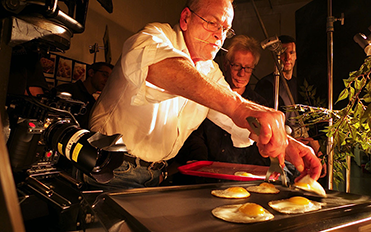 Przyborski shot the digital commercial in John Sanderson’s studio, located in Pittsburgh’s strip district. Felipe Flores, Church’s VP of Marketing, asked Glenn to create a warm, golden, morning feel to the scenes, emphasizing the product’s natural ingredients. Everything was shot on the RED “Epic” camera system, primarily using Glenn’s Canon lenses. For the extremely tight macro scenes of bacon and sausage, the unique Innovision “Probe II” snorkel lens was employed. Glenn feels the greatest feature of the Epic is its ability to shoot at almost any frame rate up to 300fps. The falling tortillas were shot at 240fps. The commercial was edited and mixed by the Kamikaze Group in Guaynabo, Puerto Rico. They also created the original music track. The ad is currently airing in HD throughout Puerto Rico. In case you’re hungry, the closest Church’s Chicken to Pittsburgh is in Akron, Ohio. I live a few miles north of downtown Pittsburgh, Pennsylvania. In our region, it’s extremely rare to have a mid-October snowfall. I woke on Saturday morning to unexpected, falling snow that was over an inch across. It was so beautiful that I grabbed one of our high-def cameras and shot a few scenes around my home. In Pittsburgh, we were lucky. Our snow melted and was gone by early afternoon. The entire Northeast U.S. didn’t fare as well with a massive 6 to 12 inch snow storm. For the latest series of Eat ‘n Park TV spots, Sarah Marince asks employees what they love about Eat ‘n Park (besides their paycheck.) In my favorite spot of the new “Team” series, Sarah gets to put the icing on EnP’s iconic Smiley Face Cookie. I currently shoot these spots on 2 HDTV digital cameras. All the sync sound sequences are shot on a Panasonic AF-100 equipped with Canon and Olympus lenses. I use the very heavy 14mm – 35mm F2 zoom for most wide angle scenes. Either a 50mm F1.4 or a 85mm F1.2 lens handles talent close-ups. My second camera for quick, hand-held cutaways is either a Panasonic GH2 or a Canon 5D mk2. All the cutaways in this spot were shot on a GH2 equipped with a 20mm F1.7 lens. Over the years, I’ve found that the only way to direct and shoot this “scripted spontaneity” is to think of each sequence as a very short play. While gaffer, Ted Wiegand is setting lights with the crew, I’ll have the talent first perform the scene or sequence without any direction. Invariably, people will naturally stay too far apart for TV. After a couple run throughs, I’ll get the desired distance between the actors. Then I’ll determine the best wide shot or master shot angle to cover the action. The close-up, return shots between actors happen naturally based on the master shot. Although I often use a Fisher 10 crab dolly, for this spot I shot all the test kitchen dialogue with my camera mounted on a monopod. It gives the scenes spontaneity and just enough movement as if the action was natural and unrehearsed. When you’re working in tight quarters, such as Eat ‘n Park’s test kitchen, the choices of camera angles and camera positions are limited, so you make the most of the best overall background for your master shot. The backgrounds for close-ups will be out-of-focus, so you can add, subtract or cheat certain scene elements. One last bit of advice, when working with “real people” as opposed to actors, let them play themselves. As long as the role they’re playing is within their normal “world” you can usually get a pretty credible performance. I’ve found that non-professionals do their best on the second or third take. After that it’s a crap shoot. BTW, that’s actually Sarah perfectly icing the cookie in the close-up! My former business partner and TV commercial director, Paul Hartwick passed away at UPMC Hospital Sunday afternoon 9-22-13. Paul and I met while working at Television Production Center (TPC) in Pittsburgh. He had previously worked as an ad agency producer at Ketchum and W.B. Doner which gave him the ability to relate to art directors and writers. In 1975, Hartwick convinced me that we could make a living by starting a commercial production company. 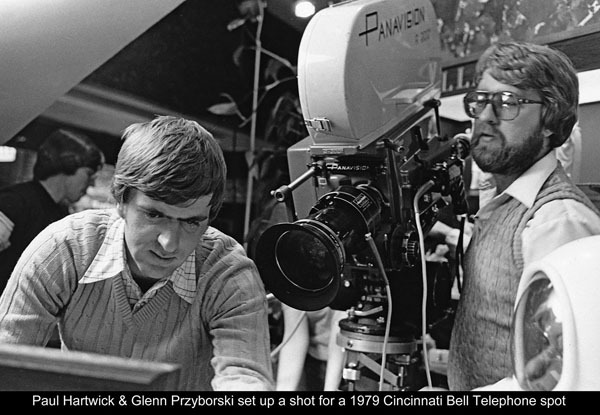 We founded Hartwick/Przyborski Productions in 1975 and operated the company through 1987. During that period “H/P” produced literally hundreds of broadcast advertising commercials for clients and ad agencies across the U.S. We worked separately on most projects and as a team on major productions, especially those from our New York office. Many Pittsburgh crew people got their first film production experience with Hartwick/Przyborski and/or TPC. Back in the mid-70’s most film projects were actually edited on film. Then a print from the lab was transferred to videotape for TV station distribution. Kodak credited Paul and me as pioneers for shooting 35mm film specifically for editorial on videotape. Paul Hartwick was an instrument rated, multi-engine pilot and an avid outdoorsman. He loved the woods, hunting, guns, and civil war re-enactments. Years ago, he dropped out of the commercial production business and moved to the Allegheny Forrest near Bradford, PA. Unfortunately, My last contact with Paul was over 10 years ago. Paul Hartwick is survived by His wife, Mary and daughters, Jennifer & Justi. Background Info: Don Nehlen is a former head coach of the West Virginia University “Mountaineers” football team. For 20 years, he lead the team to winning seasons and bowl games. Nehlen retired from his successful coaching career in 2000. You know you’re appreciated when the road to Mountaineer Stadium is named Don Nehlen Drive. A few years ago, West Virginia University Healthcare performed triple-bypass heart surgery, which saved his life. Coach Nehlen agreed to be featured in a TV commercial for the WVUH Heart Institute. This commercial is an example of combining the best image quality attributes of 2 completely different 1080P HDTV cameras. I shot all of Coach Nehlen’s on-camera interview scenes with my Sony F900R. All the cutaways or “B-Roll” scenes were shot with my Panasonic AF100. The HDTV commercial is scheduled to begin airing in August throughout West Virginia.